Paul Wedding is a best selling Author, a nationally recognized speaker, personal development Counselor, and the host of the Paul Wedding show, a call in talk show that deals with life’s issues. In a recent newspaper article, Wedding is described as “the newly arrived leading expert in the field of positive human development.” An inspiration to thousands, Wedding shows people everyday, from all walks of life and backgrounds, that not only are the things we need and desire in life a possibility, they’re inevitable. Not just another talking head, or speaking motivational nonsense, Wedding comes from a very unique perspective that has given him the clarity, and the experience of what it’s like to be on both sides. This understanding is one of the reasons he’s been so successful in helping others navigate their way through the stops and starts that many will go through, to unleashing the empowering self we all are, we just misplaced. Six short years ago, Wedding was living a much different life that he is today. He moved from his home state of Michigan to California, looking to make a new start, but found more of what he didn’t want. Eventually ending up destitute and homeless, Wedding was living and eating from a dumpster behind a Chinese restaurant. With no money, no car, no job, no friends, no family, and only the clothes on his back, he returned back to Michigan. He met a person who was in the publishing industry, David G. David agreed to look at what he’d written thus far and called Wedding two days later with the news that when he was finished, his company wanted to publish his book. “If You Only knew What You Already know” has become a best selling book, and launched Wedding into one of the most sought out speakers on positive human development today. His next best seller titled “The Inevitable Life” is due out before the end of the year, and recently went into a private personal development practice. 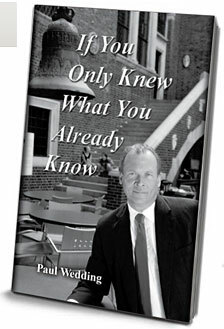 In this spiritually uplifting book, If You Only Knew What You Already Know, Paul Wedding writes about how he found a way out of his own living hell. The personal growth and life long changes set forth in this book are effective for anyone who wishes to make sweeping changes in their life, no matter what situation they find themselves in or what they have done in the past.